This is my son Hunter. He loves the video game Plants vs. Zombies Garden Warfare 2 and his favorite character is a Venus Flytrap named Chomper. As you advance through the game you get new versions of the characters. 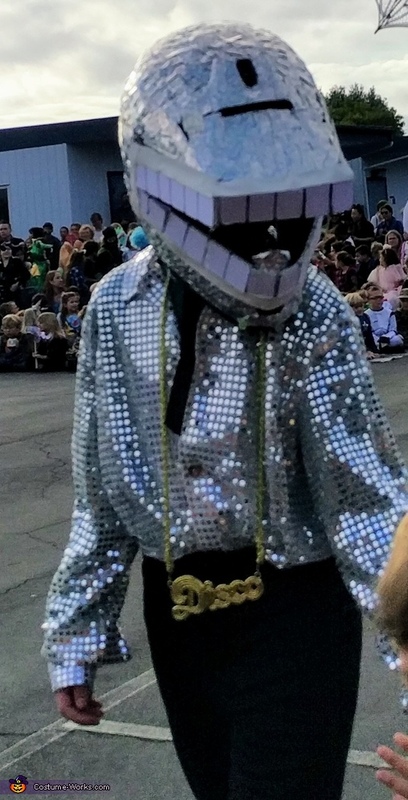 Chomper goes Disco. For his head, we needed to make a disco ball. We took a dirt bike helmet and covered it with bird reflective ribbon available on Amazon and at Home Depot. This is holographic ribbon that we cut into 1 inch squares. We hot glued the pieces on but double sided tape would work too. We made his teeth out of craft board. His lips were made out of cord keepers but white tape or felt would work too. Then we dressed him as a disco dude. Since polyester pants are hard to find we used baseball pants and added shiny material for the bell bottoms. With a sub shirt and a "Disco" necklace, he was set. For Halloween night he had light-up shoelaces and a Disco bike light available at Amazon.